Imagine if every year, your workplace went through layoffs and employee reviews the week before and after Christmas. That light at the end of the tunnel is in touching distance, it’s all gift wrap and roasting chestnuts and holiday parties, and then, all of a sudden, your job is thrown into chaos because everyone is watching their backs and wondering what the future holds. This pretty much describes the NBA right before the All-Star break. And this season’s compressed schedule and back-to-back-to-back games have already taken a mental toll on the players. Now, right when most of them are supposed to get a few days off, here come the whispers. And I love it. I love the NBA rumor culture. On the surface, it’s just a fantastically entertaining component of the league. It fuels endless second-guessing and speculation and hope and terror. Then, beneath it all, for league obsessives, there’s the whole shadow economy of the rumor industry: The “sources” giving anonymous quotes, the strongly slanted pieces outing players as locker-room pariahs or ball hogs to lower their value. With all the enjoyment you can take from this game within a game, it’s sometimes hard to think about any of it ever having consequences. Today, we learn that it does. 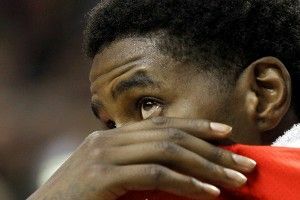 On Monday, reports circulated that Marvin Williams was unsatisfied with his station in life and wanted out of the ATL. Anyone who has been to the Trade Deadline Circus enough times will know that about 2 percent of what gets suggested is actually true, but even patently false or suspicious reports tend to make an impression. I know that on the long list of people whose feelings probably need more consideration, NBA players are not really a high priority. But there was something reading Williams’ words — clear, seemingly honest and straightforward — that reinforces the fact that like all industries really, the NBA trade rumor mill produces casualties along with its commodities. Oklahoma City and Boston. This matchup loses a bit of its luster because Rondo is serving the second game of his two-game suspension. It would have been nice to see him square off against Westbrook in a “Who Has a Bigger Chip on His Shoulder” way. Should still be a fun game anyway. Jerry Colangelo, the director of USA Basketball, says Jeremy Lin has little to no chance of being on Team USA for the coming Olympic Games in London. “There’s such a thing as paying dues,” Colangelo said. According to Brian Windhorst, Vince Carter is hosting a $30,000-per-plate fundraising dinner for President Obama in Orlando on Thursday. Kobe Bryant told Pau Gasol how he felt about the way the Lakers were handling Gasol’s future. However he did not tell Gasol he was going to announce his feelings to the world. NBA Trade Machine Says: “This trade is successful!” Let’s be really careful with the word “successful,” NBA Trade Machine.